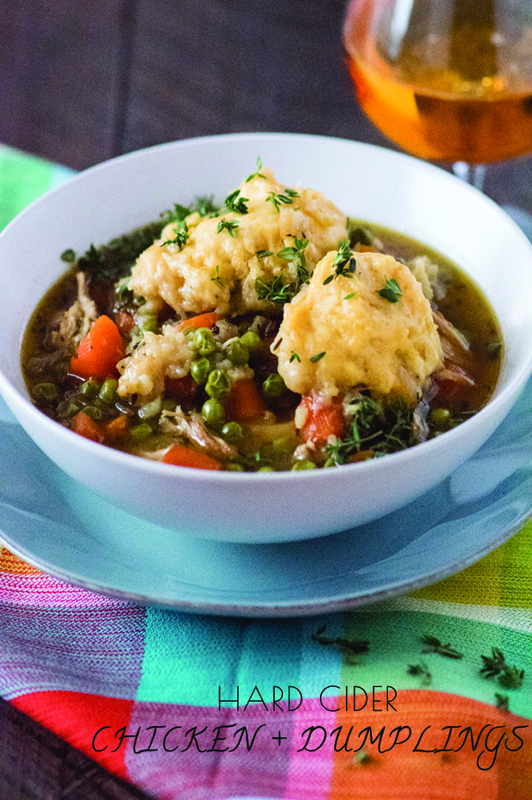 These fluffy dumplings are floating in a rich hard cider spiked soup with tasty chicken and hearty veggies giving you the ultimate cold weather comfort food! When I lived in Chicago there was a period one winter (Jan 2014) that everyone called the “polar vortex” – for several days the temperature basically never went above zero degrees (Fahrenheit). One night during that time, I invited a group of girlfriends over for dinner and I made chicken pot pie soup. I love entertaining during the cold winter months – it’s a fun way to keep people from “hibernating” all the time, and of course, it gives me an excuse to cook and try out some new recipes. The soup I made that night was loosely based on a recipe that I saw in Cuisine at Home Magazine. It had all the components of a traditional chicken pot pie, including the puff pastry crust in the form of croutons! Several months later one of my friends asked me if I could create the soup again and post it on my blog so she could try making it and also share it with some of her friends. I decided to switch it up a little, keeping most of the ingredients the same but instead of turning it into Chicken + Dumplings. The twist in this one, you know I like those twists, is the addition of hard cider to the broth. It gives this dish a really great, unique flavor. This recipe starts by browning the chicken to get it crisp on the outside, which also provides those nice brown bits on the bottom of the pan to add extra flavor! The chicken won’t be fully cooked after searing it but don’t worry, it’s going back in the pot to finish cooking pretty quickly. Next, you’ll sauté the veggies, pour in some chicken stock, thyme and a little hard cider, add the chicken back to the pot and let it simmer. You can make the entire soup portion of this recipe ahead of time. Once you add the peas (step 5 below) you’ll want to remove the soup from the heat and let it cool. Then refrigerate for a day or two. When you are ready to finish, reheat the soup then add the dumplings and your ultimate comfort food will be ready! If you are making everything at once, just add the dumplings after you stir in the peas. They should cover just about all of the soup as you see in the photo below. Let them cook until they are firm to the touch and you have nice fluffy dumplings. Then you are ready to eat….just don’t forget to remove the bay leaf before you serve the soup! One of the many things I love about this version is that it’s basically a one-pot meal (you’ll need a bowl for mixing the dumplings). While this is a little richer than the original version, it is also a bit more hearty so it’s great, yummy comfort food on a cold winter day. Who doesn’t love fluffy dumplings floating on a rich soup of tasty chicken and vegetables?! In a large dutch oven, heat olive oil over medium-high heat. Add chicken breasts and brown for 3 minutes per side. Remove from pan and keep warm while you saute the veggies. Add onion and carrots to the pan, cook for 3 minutes. Add garlic and cook for 1 minute. Deglaze pan with hard cider. Add chicken, broth, thyme and bay leaf. Return the chicken to the pan, reduce heat to medium-low and simmer for 20 minutes. While the soup is simmering prepare the dumpling batter by mixing flour, salt and paprika in a medium bowl. Add the butter and using a fork or pastry cutter, mix into flour mixture. Add egg and buttermilk and mix until a stiff, sticky dough forms. Once you’ve finished making the dumpling dough remove the chicken from the pan and shred or chop into bite-sized pieces. Add the peas to the soup and stir to incorporate. Using a kitchen teaspoon, drop large spoonfuls of the dumpling batter into the simmering soup until the pot is full or all of the dumpling batter has been used. Cover and simmer for 10 minutes or until the dumplings are cooked (they will be firm to the touch when done). OH you won me over with this take on chicken and dumplings. Pinned. You had me at the chicken dumplings, but add in the hard cider and I’m now obsessed. This is my perfect fall meal! LOVE! This sounds so good! I love adding hard cider to recipes and I will definitely have to give these dumplings a try! What a warming comforting dish! Yum, Kathryn! This looks amazing! Love the addition of the hard cider!